Thompson Teteh has been named in the centres for this weekend’s Intrust Super Cup Round 20 clash against Burleigh Bears at the Oil Search National Football Stadium in Port Moresby. 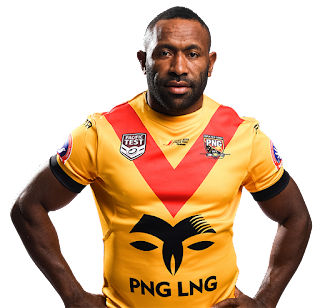 Teteh was suspended by the QRL judiciary for one match and missed last Sunday’s Country week game against Norths Devils in Lae, Morobe Province. Ila Alu moves to the extended bench for Willie Minoga to start at second row. Coach Michael Marum will finalise the 18 man team at the Captains Run on Saturday. The SP Hunters take on Burleigh Bears at 3.00pm on Sunday July 29, 2018 at the Oil Search National Football Stadium. The first game to kick off the day at 12.15pm will be a Digicel Cup Rnd 17 game between Kroton Hela Wigmen and Goroka Bintangor Lahanis. At 5.00pm after the SP Hunters vs Burleigh Bears game will see PRK Gulf Isou take on Waghi Tumbe. Meanwhile SP Hunters coach Michael Marum has clarified that those players suspended by the QRL Judiciary are NOT allowed to play in the Digicel Cup teams. “The suspension applies to all levels of the game including Digicel Cup and their local leagues,” Marum said.